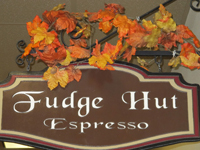 Find delicious specialty food in Leavenworth, everything from chocolate and taffy to cheese and fruit. To pair up the food with a nice bottle of wine, see our page on the wineries and tasting rooms. Icicle Coffee & Chocolates. 900 Front Street, Suite E, Leavenworth, WA 98826. Phone: 509-393-6011 or 509-888-4664. Rocky Mountain Chocolate Factory. 636 Front Street, Leavenworth, WA 98826. Phone: 509-548-6525. Cup and Kettle. 725 Front Street, Leavenworth, WA 98826. Phone: 509-548-8327. Alps Candy. 13901 Highway 2, Leavenworth, WA 98826. Phone: 509-548-4419. Chukar Cherries. 939 Front Street, Leavenworth, WA 98826. Phone: 509-888-7655. The Taffy Shop. 900 Front Street, Leavenworth, WA 98826. Phone: 509-548-4857. A Matter of Taste. 647 Front Street, Leavenworth, WA 98826. Phone: 509-548-6949. Cured by Visconti. 636 Front Street, Leavenworth, WA 99826. Phone: 509-888-0424. Smallwood's Harvest. 10698 Stemm Road, Leavenworth, WA 98826. Phone: 509-548-4196. Dan's Food Market. 1329 Highway 2, Leavenworth, WA 98826. Phone: 509-548-5611. Safeway. 116 Riverbend Drive, Leavenworth, WA 98826. Phone: 509-548-5435.